When you use the API Explorer in your browser, you can use Misty&apos;s API endpoints to try Misty out, without writing any code. We recommend using the API Explorer with the following browsers: Safari, Chrome, Firefox, and Microsoft Edge (latest versions). Note: It&apos;s not generally recommended for multiple users to each use a separate instance of the API Explorer to connect and send commands to a single Misty robot. If more than one person does connect to Misty at the same time, as in a class or group development environment, people will need to take turns sending commands, or Misty may appear to respond unpredictably. As with the companion app and Blockly, when using the API Explorer, make sure your computer and Misty are on the same Wi-Fi network and using Bluetooth. Open up the API Explorer in a browser window. The API Explorer should look like the screenshot above. Enter the IP address of your robot from the Info tab of the companion app and click the Connect button. Look for the message "Connected successfully" to appear at the bottom of the API Explorer window. Experiment with changing the color of the LED on Misty&apos;s chest or changing her eyes by selecting a different mood. Misty comes with a number of default system image files that display on her screen, as well as default audio files that she can play. To add your own sounds and images to Misty, follow these steps. Note: The processes for working with audio and image files on Misty are the same, with the exception that image files can be downloaded to your computer from the API Explorer. Would you like to have Misty sing a song or play a particular sound when her face recognition identifies someone in particular? What about giving her some custom eyes or other interesting images for her display? For images, valid file types are .jpg, .jpeg, .gif, and .png. Because Misty does not adjust the scaling of images, for best results use an image with proportions similar to that of Misty&apos;s screen (480 x 272 pixels). For audio, you can upload all file format types, however Misty cannot currently play OGG files. The maximum size for both audio and image files is 3 MB. To select a file to upload to Misty, either drag a file into the rectangular drop area or click the Choose a file... text and browse for the file on your computer. After you choose a file, select the Save to Robot button. A message pops up to confirm the file is being saved. Once the upload is complete, you can confirm your file has been saved by clicking the Populate Audio List or Populate Image List button. Scroll through the list to find the file you just saved. Click the Populate Audio List button to get a list of the current audio files saved to your robot. Choose the listed file to play. Click the Play Clip button to hear Misty play the clip, or click the Play Clip in Browser button to hear it in your browser. 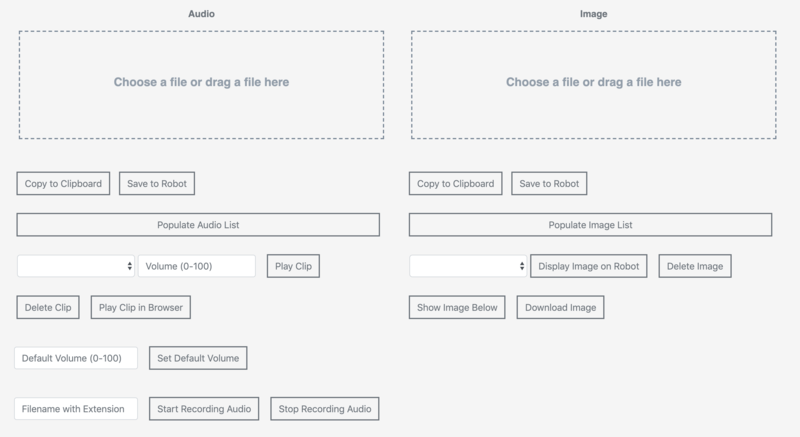 Click the Populate Image List button to get a list of the current image files saved to your robot. Choose the listed file to display or download. Click the Display Image on Robot button to see the image appear on Misty&apos;s screen, or click the Show Image Below button to view the image in your browser. Click the Download Image button to download the chosen image to your computer. Misty getting a bit overloaded with custom files? It&apos;s easy to tidy her up again. Click Populate Audio List or Populate Image List to obtain a list of the audio or image files you&apos;ve saved to Misty. Choose a listed file to delete. Note: You can only delete audio or image files that you have previously uploaded to Misty. The API Explorer posts an error if you attempt to remove one of Misty&apos;s default system files. Click the Delete Clip button to delete the audio file, or the Delete Image button to delete an image file. Refresh your screen and reconnect API Explorer to your robot. Click the Populate Audio List or Populate Image List button. The file you deleted should no longer be included in the list. To select a file to convert, either drag a file into the rectangular drop area or click the Choose a file... text and browse for the file on your computer. After you choose a file, a checkbox appears under the white rectangle. Click that checkbox to confirm the file to convert. Click the Copy to Clipboard button. A message pops up to confirm that your file is being copied. There are a variety of ways to use the API Explorer to drive Misty. First, use Select a motion to select the driving motion you want Misty to perform. Use the Duration (ms) control to specify the amount of time Misty should drive. Click Move Robot. Misty will stop driving automatically when the time is up. Using this command allows you to drive Misty forward or backward at a set speed, with a given rotation, for a specified amount of time. Use the Linear Velocity control to set the speed Misty travels in a straight line. The control can be set from -100 (full speed backward) to 100 (full speed forward). Use the Angular Velocity control to set the speed and direction of Misty&apos;s rotation. The control can be set from -100 (full speed rotation clockwise) to 100 (full speed rotation counter-clockwise). Note: For best results when using angular velocity, we encourage you to experiment with using small positive and negative values to observe the effect on Misty&apos;s movement. Click Move Robot. Misty stops driving automatically when the time is up. You can use these controls to drive Misty in a variety of directions. Click a directional button, and Misty will start driving. Adjust the Velocity level, if she is going too quickly or too slowly. Use the center control to stop driving. The data that&apos;s sent over WebSocket connections is described in detail here. 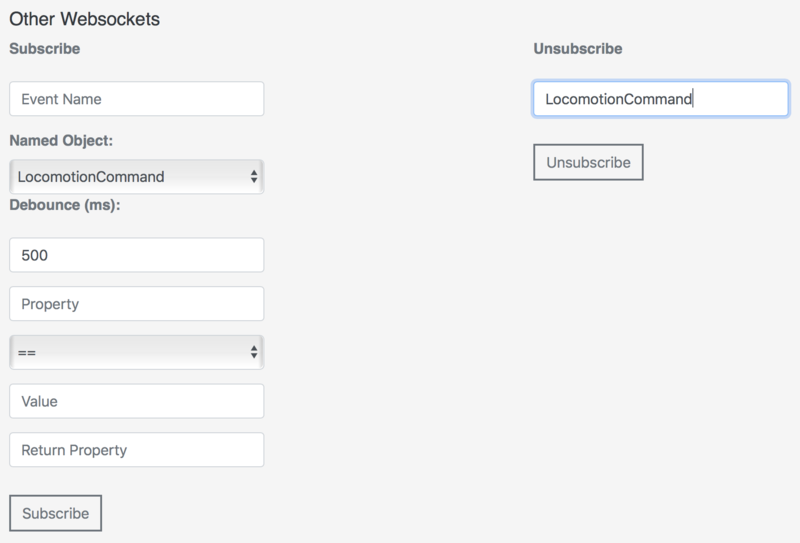 See our tutorials for examples of programmatically subscribing to WebSocket data to create skills for Misty. Select Show Sensors to view the available sensor websockets. You can view a stream of distance data from Misty I&apos;s four time-of-flight sensors in the API Explorer. For an example of obtaining time-of-flight data from Misty programmatically, see this article. In the Sensor Data area, locate the Time of Flight controls. Toggle the switch on for the sensor position for which you want to view distance data. You can see the time-of-flight sensor&apos;s data in the corresponding Distance (meters) field. In the Sensor Data area, find the Battery Voltage controls. Toggle the Battery switch on. You can see data from Misty&apos;s battery sensor in the Battery Voltage field. Find the Other WebSockets controls in the API Explorer. Event Name: [Optional] Provide a name for this subscription. If no name is specified, the value for Named Object is also used for the Event Name. Debounce: [Optional] Provide the minimum amount of time between data events. Property, Comparison, Value, Return Property: [Optional] These allow you to set filters for the data of interest and the data returned. See the instructions in the API Explorer for more details. When you are finished, go to the Unsubscribe controls. 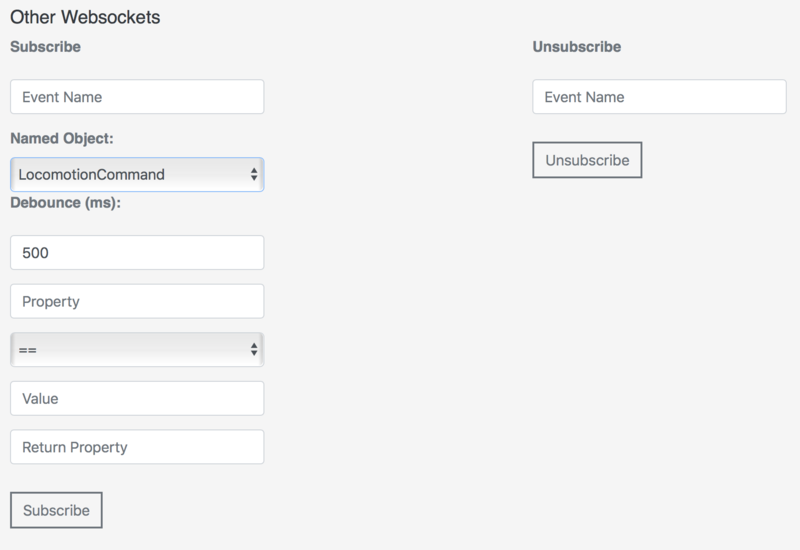 In the Event Name field, enter the name of the Named Object to which you subscribed (or the Event Name if you provided one). 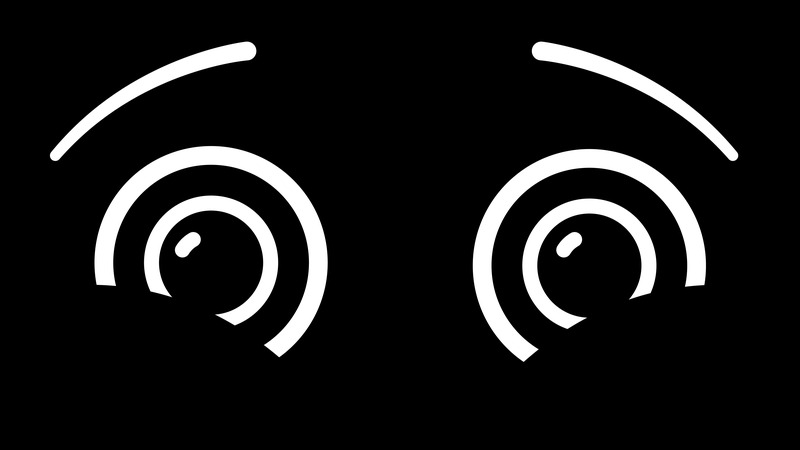 Misty&apos;s ability to recognize faces is under development. To try face training and recognition, follow these steps. 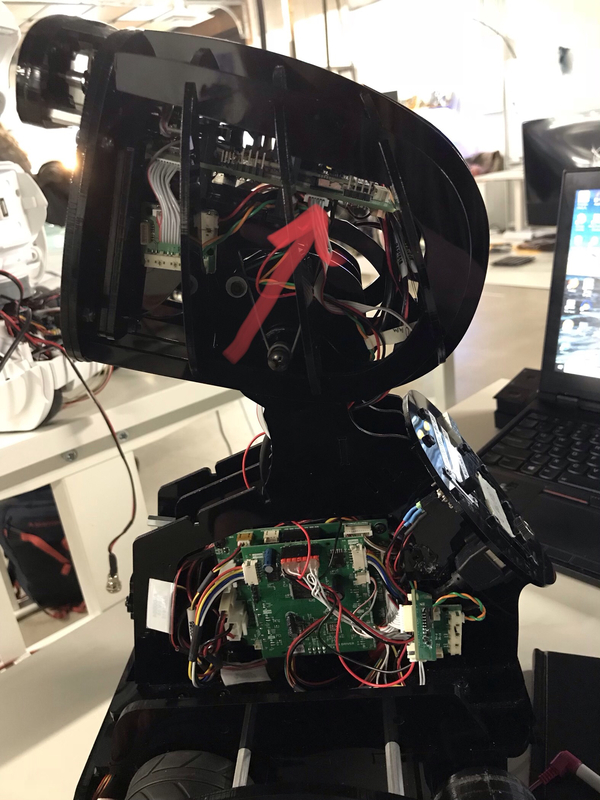 Make sure that your robot is connected to the API Explorer and that the light on Misty’s HD camera (located above her eyes on Misty I) is solid blue. In the Beta Commands section, go to Computer Vision and enter a name in the Face Training input box. Position a single person’s face in a well-lit area 1-6 feet from Misty’s camera. Do not attempt to train Misty to recognize more than one person at the same time. Once you&apos;ve trained Misty on a person&apos;s face, you can click Start Face Recognition. Position the person’s face in a well-lit area front of the camera. When finished, click Stop Face Recognition. Note: The face detection and recognition data that Misty sends is described in detail here. Note: Misty I only provides movement along one axis: pitch. This means that up and down motions are all that can be controlled for Misty I.
Misty can record a ten second video with her 4K camera. You can use the API Explorer to start the recording, stop the recording, and download the recording to your web browser. Note that Misty records videos in MP4 format at a resolution of 1080 × 1920 pixels. Misty only saves the most recent video recording to her local storage. Recordings are saved with the filename MistyVideo.mp4, and this file is overwritten with each new recording. 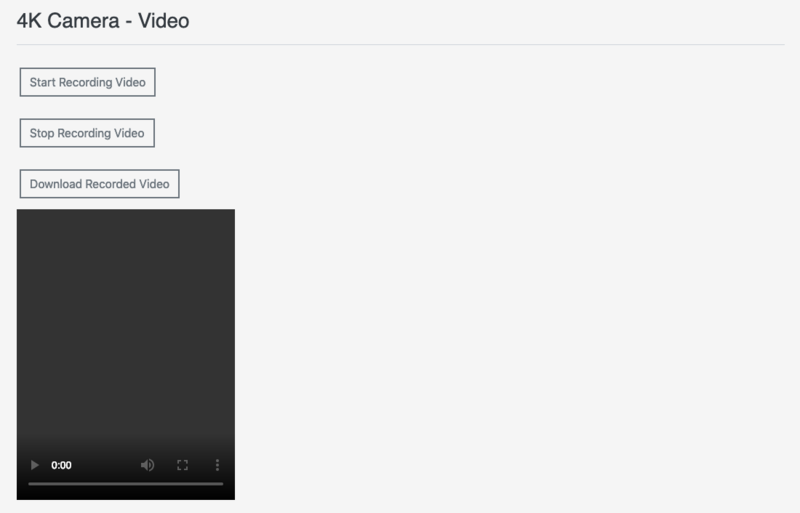 Click Start Recording Video to start Misty recording a video, and click Stop Recording Video to stop the recording. Note that if you do not click Stop Recording Video, Misty automatically stops recording after 10 seconds. Click Download Recorded Video to download the most recent recorded video recorded to your web browser. Misty can take pictures with her 4K camera as well as the ultra-wide vision camera on her Occipital Structure Core depth sensor. Note: Images captured with these cameras are not saved to Misty&apos;s memory. To save photos taken with one of these cameras to Misty, follow the directions below to download these photos to your computer, then use the Asset Management controls in the API Explorer to save them to your robot. Use the Camera controls to take a picture with Misty&apos;s 4K camera. Click Take Picture and Display to take a picture and display it in your browser, or click Take Picture and Download to download the picture to your computer. Note: Misty&apos;s 4K camera may not work if the data stream from the Occipital Structure Core depth sensor is open. If you can&apos;t use Misty&apos;s camera to take and display or download a picture, click Stop Camera in the Ultra-Wide Vision Camera controls, then try again. Click Start Camera to turn on the data stream from the depth sensor. Click Take + Display Photo to take a photo and display it in your browser, or click Take + Download Photo to download the photo to your computer. 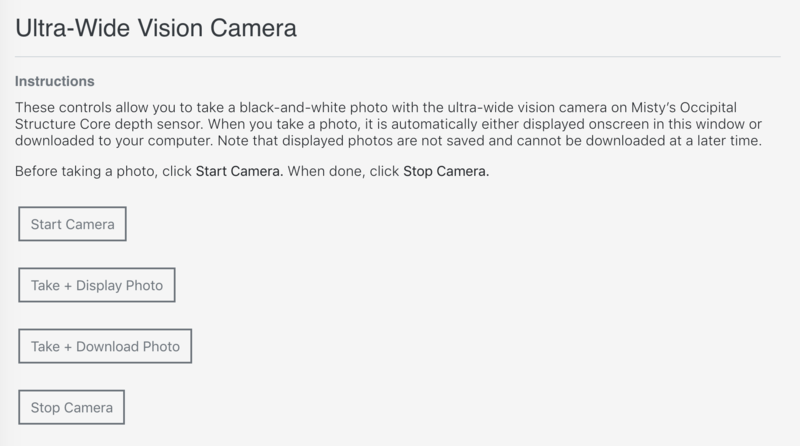 Click Stop Camera to turn off the data stream when you are done using this camera. Misty can generate a map of your home or office, track her location on a map, and follow a path you specify. The first step in any of these is to ensure that Misty has "pose". Having pose means Misty knows her location and orientation in space, in X,Y coordinates. Note: The software that runs the Occipital sensor for mapping and tracking is alpha. Experiment with mapping, but recognize that it is unreliable at this time. Important! For Misty&apos;s maps, the origin is at the bottom right corner. X is the direction the robot is looking at the start of mapping and is read from the bottom of the map to the top of the map. Y is read from right to left, with zero being on the right side of the map. Before attempting to map or track, you must obtain pose. If the API Explorer is not already connected to your robot: At the top of the API Explorer window, enter the IP address of your robot (from the Info tab of the companion app) and click the Connect button. Look for the message "Connected successfully" to appear at the bottom of the API Explorer window. Ensure Misty is in a well-lit (not dark) environment. Scroll down to Alpha and find the Mapping section. If Misty&apos;s status is other than "Ready", click Reset, then click Get Status again. Note: If Misty&apos;s status does not return as ready after multiple Reset and Get Status commands, restart Misty and start these instructions over. Verify that the mapping sensors are working. The Occipital Structure Core depth sensor near Misty’s right eye should be glowing blue. Confirm that Misty has not lost her Wi-Fi or Bluetooth connection. To do this, open Misty&apos;s companion app. If she has lost Bluetooth, the app will ask you to reconnect. When mapping, drive slowly to give the mapping system the best chance to fill in all details. Slowing Misty down increases mapping effectiveness. When possible, making wider turns also improves mapping results. Note: Every time you create a new map, the former map is deleted. You can use the API to get a map and back it up, if desired. Note: If Misty loses pose after generating a map, she will need to generate a new map and start over. Note: It can be difficult to drive Misty manually and maintain the low speeds required for her to map an area without losing pose. If you are unable to successfully map an area with the API Explorer, you may be able to generate a map programmatically by coding Misty to very slowly explore an area. Follow the above instructions to obtain pose. Click Start Mapping. After a few seconds, the Pose light should turn from red to green. If it does not turn green, follow the instructions to obtain pose above, then try again. Select one of the drive options (Turn in Circle, etc.) or use the Locomotion: Manual Driving controls to drive Misty yourself. Move Misty SLOWLY around a small space (start with an area no more than 20’ x 20’). Click Stop, then try driving Misty backward for a second. Wait a few seconds and see if she gets pose again. If that doesn&apos;t work, click Stop Mapping, then click Start Mapping again. When done driving, click Stop. Scroll down to the Map section and click Get Map. You can have Misty track where she is on a map that she has already created or track without a map. You can also have Misty follow a set path by giving her X,Y map data from a map she has previously generated. Important! For Misty&apos;s maps, you read coordinates from the bottom right corner. X is the direction the robot is looking at the start of mapping and is read from the bottom of the map to the top of the map. Y is read from right to left, with zero being on the right side of the map. Click Start Tracking and begin driving Misty. Activating tracking provides pose data in the SelfState websocket for where Misty is on the map you previously generated. Or, if you have not previously generated a map, Misty sets her beginning tracking position as 0,0. If Pose turns from green to red while Misty is moving, try backing Misty up for a second and see if she gets pose again. Ensure that Misty still has pose. Supply individual X,Y value pairs and click the Add Waypoint button to add these individual waypoints to a path. Use the field next to the Follow Path button to input an entire path of X,Y values, then click Follow Path. A path of waypoints should be entered in the form of X1:Y1,X2:Y2,X3:Y3. You can use the API Explorer to perform over-the-air (OTA) updates for Misty. We recommend you check for updates weekly. To find the version number(s) for the most recent system updates, see the release notes on our Community site. First make sure that Misty is plugged into a power source and is connected to the Internet. Scroll down to the bottom of the API Explorer window and find the System Updates section. Click Check for Updates. It may take a few seconds, but a message will pop up on the bottom of the window telling you if your Misty has any updates available. If there are updates available, click Perform System Update. Misty will begin downloading the update in the background. The download itself may take several minutes to an hour, depending on the speed of your Internet connection. Note: During the download and update, Misty is still functional, however it is NOT recommended to send any commands to Misty or drive her during this process. The update process may take up to a half hour total. The update process is not complete until Misty restarts and her happy eyes re-appear. 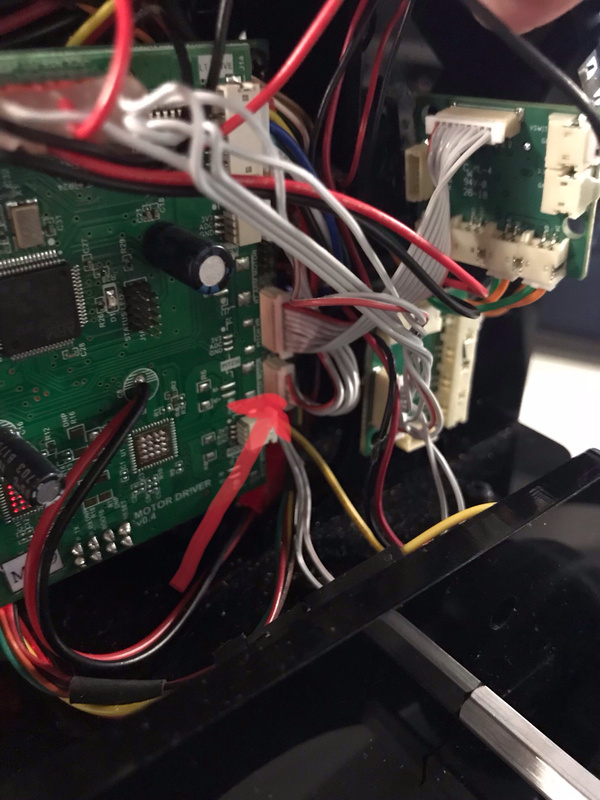 If your robot consistently fails to update, there may be a loose or faulty connection on Misty&apos;s headboard or real-time controller board. To check these connections, visually inspect the connectors on the headboard first, near the location indicated below. Then check the connectors on the real-time controller board, indicated below. Please contact Misty&apos;s support team if the connections on either of these boards appear loose or broken. If a full system update fails to update every component of your robot, you can perform a targeted update to update these components individually. To perform a targeted update, check the box next to each component to attempt to update. Click Perform Targeted Updates to start the update process. Note: Always try a full system update before trying a targeted update. You can make sure individual components are up-to-date by comparing the version numbers for each component to the most recent release notes on the Misty Community site. The version numbers for individual components are returned by the Get Device Information button in the Easy Commands section at the top of the API Explorer. While it’s usually easiest to use the Misty Companion App to connect Misty to your home Wi-Fi network, sometimes there can be issues with this method. In that case, you can use the API Explorer and the USB-to-Ethernet adaptor that came with your robot to connect Misty instead. Connect the adapter from your network router to your computer. Do not connect the adapter to Misty yet. Use the command line to find the IP address of the adapter. On Apple/Unix, open a command-line tool, enter ifconfig and find the Ethernet adapter and its IP address in the list of results. Note: On a Mac you may also be able to find the IP address under System Preferences > Network. On Windows, open the command prompt, enter ipconfig, and find the Ethernet adapter and its IP address in the list of results. Once you have the IP address for the adapter, unplug the USB end of the adapter from your computer and re-plug it into the USB port on the back of your robot. Keep the other end plugged into your router. Open the API Explorer and connect to your robot by entering the IP address and clicking Connect. Look for the message "Connected successfully" to appear at the bottom of the API Explorer window. Scroll down to the bottom of the API Explorer page to the Connect Wi-Fi section. Enter your Wi-Fi network credentials here and click Connect to Wi-Fi. The process can take a few minutes.